Fishing rod action rates where the rod will flex when pressure is applied to the rod tip. Finding the best rod for your needs is dependent on action ratings. There are three general ratings that measure action: Fast, Moderate and Slow. There are also some in-between ratings like Extra-Fast and Moderate Fast. 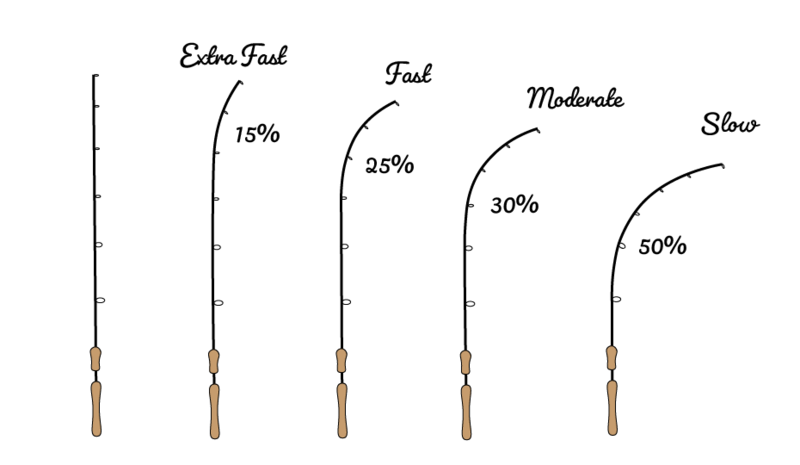 Fast Action bends in the top 20-30% of the rod, and it is the most common action rating. Moderate action bends at the 30-40% mark and Slow action bends at 50% or below. Fast Action is popular because it provides sensitivity for monitoring bites, and can quickly load up for hook setting. I recommend Fast Action for all beginners, and anyone trying out a handful of different techniques or targeting different species. Faction action is the best rod rating for sensitivity. Moderate action is common for targeting larger fish with aggressive lures. The longer flex allows for greater casting distance, so you can send crankbaits and spinnerbaits further. Anglers fishing large lures aggressively do not need sensitive bite indication. Moderate action rating is ideals for casting lures because it sacrifices sensitivity for improved casting distance. Choose a slow action rating for casting smaller lures for panfish and trout. The parabolic flex of a slow action rod helps to launch your small offerings with light line. Fishing Rod Power rates the amount of pressure needed to bend the rod at its action rating. Power ratings are ultra-light, light, medium light, medium, medium heavy, and heavy. 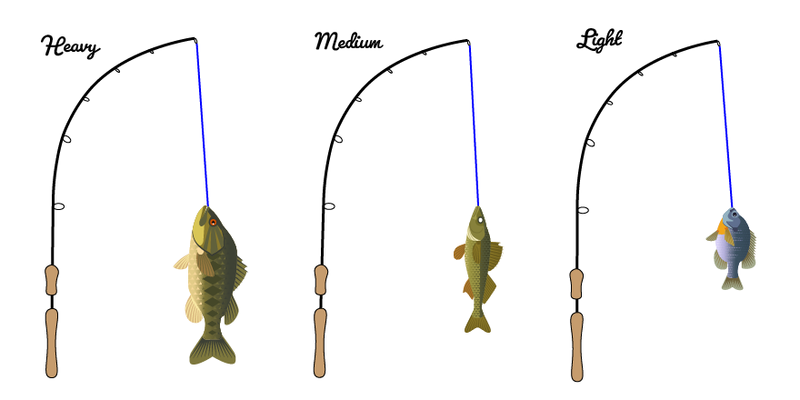 Power ratings correspond to the rod’s line and lure ratings. Beginners can select the right power by the general size of fish they target. Light power facilitates lighter tackle and smaller lures for Panfish and Trout. Medium power handles common lures and rigs sized typically for Bass and Walleye. Heavy power manages larger lures and rigs for big Bass, Pike and Catfish. A Medium Power rod with a Fast Action rating will typically sport a line rating of 6-12 Lb. and a lure rating of 1/8-5/8 Oz. If you are spooled with 10 lb line and a 1/2 Oz. lure, your rod will partially load up to your action rating. This is good, as you retrieve the lure your fast action rod should bend about 10-15%, leaving you another 10-15% to monitor the bite and set the hook. A line and lure pairing that is heavier than the recommendation will load too much of your rod before the bite (all 20-30%). 15 Lb. test and a 1 Oz. lure overloads the rods completely. An overloaded rod can lose fish from the tension or even snap your rod. Here is a very general list of action and power recommendations based on species. If you plan to use common lures and rigs for a particular type of species, these power and action ratings will perform best. Fishing Rod Only says Action? Many rod manufacturers oversimplify the specifications, mixing power and action together. Common examples are “Light Action, Medium Action, Medium Heavy Action” etc. When this is the case, assume that the rating describes the rod’s power. I find that when the correct action rating is missing, the lighter ratings are usually moderate to slow action and the heavier ratings are moderate to fast action. So a “Medium Action” is likely a Medium Power Fast Action and a “Light Action” is a Light Power Slow Action. Fishing rod action and power can limit your abilities if you go to the far ends of the spectrum. The best rod specifications for someone buying 1 rod & reel combo is a Medium Power, Fast Action rating. If the manufacturer does not break the power and action ratings up, then this recommendation is likely advertised as Medium Action. Our team uses our Multi-Species Combo as our primary rod and reel, and we generally do not leave home without it for any days on freshwater or in-shore surf fishing.